Bashundhara Group, a leading business conglomerate, launches three new products — khata (writing paper), notebook and gift wrapper — in the city on April 14, 2012. Editor of the Kaler Kantho Imdadul Haque Milon, Adviser (press and media) to the Bashundhara Group Mohammad Abu Tayeb, BG Deputy Managing Director Mustafizur Rahman, and Senior Adviser (Tech) to the Chairman of Bashundhara Group TIM Latiful Husain are seen at the launching ceremony. 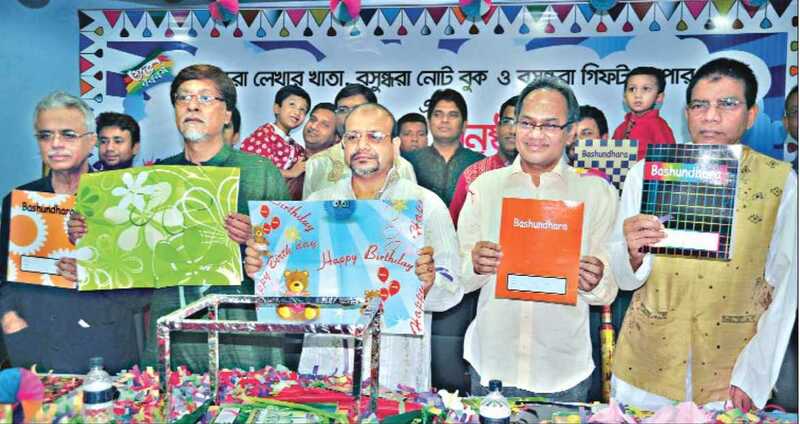 Dhaka, April 16:Bashundhara Group, a leading business conglomerate of the country, has launched three fresh products — khata (writing paper), notebook and gift wrapper — on the local market to meet public demand at cheap rates. The three necessary products went on sale on Pahela Baishakh, the first day of Bangla New Year, on Saturday. Deputy Managing Director of Bashundhara Group Mustafizur Rahman launched the products at a program at Star Cineplex of Bashundhara City Shopping Mall in the capital. The high-ups of the company highlighted salient features of the products, including quality and prices. Yousuf Ali Sarker, marketing manager of Bashundhara Paper Products, said the company produced khata and notebook with high-quality paper made to offer those to students and others in cheap rates. As Bashundhara paper has made goodwill across the world and is being exported to various countries, including the Indian subcontinent, the company has responded to the domestic necessity and come to the local market with the useful products. “As a section of businessmen are selling spurious and substandard writing paper in the name of Bashundhara Group, the company opted to saturate the local market with its real products,” he added. About the specialty of the products, Yousuf said unlike other products in the market, Bashundhara khata and notebook will be easily distinguishable for quality paper, cheap rate, more pages and perfect size. He sought everybody’s cooperation so that Bashundhara Group can serve the country and its people with quality and useful products. TIM Latiful Husain, Senior Adviser (Tech) to the Chairman of Bashundhara Group said the company is going to hit the market with more such useful products with a view to meeting people’s basic demands. “Last year, the company supplied textbooks to the primary sector. The company has got a contract of supplying 25 millioin books again only for its fine quality,” he added. Bashundhara Group will emerge as the biggest company in the subcontinent within a span of five years, the Kaler Kantho editor hoped. Replying to a query by journalists and businessmen, the DMD of the company said Bashundhara khata will be of three categories — premier, recycling and newspaper. Mohammed Abu Tayeb, adviser (press and media) to Bashundhara Group, was present, among others, at the event.